I was asked to participate in a Q&A with several Dawg bloggers to be posted Monday at College Football Zealots. Hopefully, my answers to the following questions will be somewhat sound. I'll post my answers early next week. What do you think? 1- Which game is more critical for Georgia to win: Boise State or South Carolina? 2- Other than Isaiah Crowell, which incoming freshman do you think will have the biggest impact in 2011? 3- Who are some under-the-radar guys that you think will step up for Georgia this year? 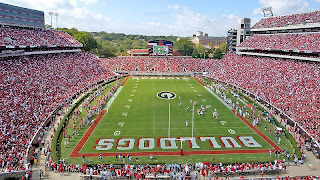 4- What makes you most excited about seeing Georgia play this year? 5- What makes you the most nervous about seeing Georgia play this year? 6- Athlon Sports has rated the Dawgs at #14 and Phil Steele has them at #9 in their pre-season polls. Both have Georgia winning the SEC East and playing in the Capital One Bowl. What needs to happen for Georgia to live up to these lofty expectations. 4. The car crash nature of the program. 5. The car crash nature of the program. 6. We must stay healthy. There's no experienced depth anywhere. Lose Crowell, Murray or a lineman and it's a disaster. Lose Jenkins, Boykin or Jarvis and the drop off is a quantum leap. Thanks for participating. I'm looking forward to the final product on Monday. 1. SC - win the east and the SECCG and 8-4 or 9-3 is OK. Don't make it to ATL and 10-2 is somewhat disappointing. 5. Can offense avoid games like last year against Carolina, Miss. State, UCF, and 1st half against UF. 6. Beat SC and Miss. State, don't lose to lesser teams. 1. SC. I'm more worried about SEC standings than national perception at this point. 6. PWD pretty much nailed this one, though I would add not having any games like we did the first few last season where the team didn't look interested in the game until somewhere around the early part of the 4th quarter. Gotta come out swinging from the first kick. 1. SC. Gotta beat them to win the East, but Boise State is HUGE for national perception. 2. Ray Drew. I can see him being put into some key pass rushing spots and making some big plays. I wouldn't depend on him in coverage, but he can be an impact guy if Grantham picks his spots well. 3. Caleb King. I don't know how under the radar he is, but I don't think anyone expects him to be starting by midseason. This is his last chance to audition for the NFL, I think he'll make the most of it. 4. Young talent. Aaron Murray. John Jenkins. 5. The wheel route. Safety play. The wide receiver corps. Marcus Lattimore. 6. Aaron Murray has to start showing up in the 4th quarter. John Jenkins and Kwame Geathers have to be the guys we expect them to be. Richt has to coach to win. 1. Critical in terms of our goals? SC. Critical in terms of avoiding the "here we go again, UGA is heading south" verbage? Boise State. I'd much rather beat SC. 2. Mitchell is a good bet. 3. Based on G Day, Geathers. 4. To see if the S&C change is worth the ink it has been receiving. 5. More conservative playcalling. I've been wanting a go-for-the-jugular attack for a while and if we have the horses, I'd like to see it. 6. (Based on us being relatively healthy and Crowell coming out of the gates strong) We have to beat SC & UF. That's it. Unless UT comes out and blows everyone's doors off, we have GOT to win those 2 games. That sets up a showdown with either LSU or Bama and it's go time at that point. Anything else is going to be more of the same and the calling for the guillotine will continue. 2. No idea. Probably an o-lineman b/c we are so thin. 3. Wide receiver, I hope. 4. I love Georgia no matter what. 5. Coach Richt is still the coach and I'm afraid we're going to be a pussified team again. 6. Finish the Drill - get in shape, compete, coach to our talent. 1. South Carolina. Conference games always take precedent over OOC games. 2. Corey Moore or Damien Swann. There is PT-aplenty to be had in the secondary. 3. Jarvis Jones and Michael Bennett. 4. Murray's development and year 2 of the 3-4. 5. OL and secondary depth, the fact that Georgia has lost its killer instinct.